I admit this title doesn’t have the same ring—or as many exclamation marks—as those headlines you see in supermarket magazines: “Drop 10 pounds in 10 days!” or “Be beach body ready in two weeks or less!! !”And it’s strange that those types of headlines continue to sell. Because if it were so easy to lose weight (and, more importantly, keep it off), then there wouldn’t be an obesity crisis or a multi-billion dollar a year diet industry. We would all follow this “advice”, shed the necessary pounds before the next season rolls around, and bask in the glow of our leaner, fitter body. Job done. But that’s not the case and the headlines continue to proliferate, rapidly increasing as we approach the New Year: the lure of the quick fix is hard to beat. Yet for the vast majority of us, the weight wasn’t put on overnight. The weight wasn’t even put on in 10 days or two weeks or a month. It was the result of choices we made each day, one day after another, for months or years on end. For myself, I know exactly what did it: using cake as a coping strategy to deal with stress (it’s a poor strategy: I was still stressed once the cake was gone), being less active than I should be, and eating far too many carbs. And it crept up so slowly that I didn’t really notice until my clothes stopped fitting properly. But over 2018 I have managed to shift 20 of those pesky pounds by doing two things: 1) eating healthier, and 2) avoiding plastic where possible. Does the second one surprise you? Last year, Jon and I made the commitment to reducing single-use plastic, and one of the first things we did was overhaul the kitchen. No more ready meals. No more store-bought treats in plastic clamshell containers. No more individually wrapped products or packets. Avoiding plastic made us do that thing that nutritionists recommend, but we had never actually gotten around to trying: planning our meals in advance. Eating without plastic isn’t hard, it just takes a little forethought and a smidge of research to figure out what you can get at which shops. As a result, you naturally start to eat healthier: my intake of fruit, veg, and other fresh food went up, empty carbs went down. And this has been reflected not only in the numbers that flash up on my scale but in clothing that no longer feels quite so tight. Yet perhaps more importantly, because healthy eating was now connected to a deeply-held environmental value, I had the willpower to resist the siren song of junk food (most of the time). Saying to myself I don’t want to eat X because it comes wrapped in plastic (and A LOT of unhealthy things comes wrapped in plastic), made it much easier to resist compared to the old standby of “Oh, I’m trying to lose weight, I really shouldn’t …” then eating it anyway. 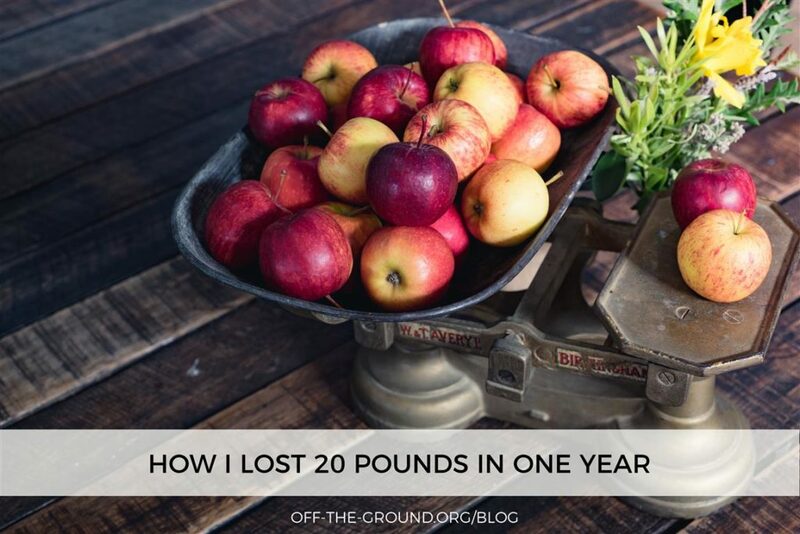 Having two goals that support each other—healthier eating and plastic reduction—meant I was able to achieve both. Preliminary research: Check out Stephen Guise’s Mini-Habits for Weight Loss. It’s a great description of how small habits can add up to big results. Start before you plan to start: One of the problems with keeping New Year’s resolutions is that there are often bumps along the road of creating new routines, and it’s so easy to fall back on established negative habits. However, if you take the next six weeks to begin to make changes, you can figure out where you run into problems and find solutions to them. Then, once you ring in 2019 and start “for real”, you’re all ready to go with the tools you need to be successful. Be aware of when you make poor food choices: For me, it’s when I’m hungry. If I keep myself fed, it is much easier to choose the carrot over the stick (of chocolate). As a result, my desk drawer at work looks like it belongs to a squirrel since it’s stuffed with apples and walnuts to nibble on. But it works and, as a side effect, I no longer get post-lunch drowsiness caused by grabbing a snack high in sugar and low in nutrition. Know your why: If you are looking to lose weight (in addition to making healthier food choices), make sure that the reason is one that has meaning. Just focussing on a number doesn’t have much emotional resonance. But having more energy to play with your children/grandchildren, being healthier in general, or, in my case, the desire to avoid shopping for new clothes, can be far more motivating over a longer period of time. Keep your expectations low: As I mentioned at the start, our weight has a tendency to sneak up on us over years. Trying—and failing—to lose it over mere weeks is a recipe for demotivation and putting it all back on again, usually with a few extra pounds for good measure. But changes have to be sustainable over decades and should become part of your day-to-day life. So taking 12 months, or even a few years, to work towards your goal gives you a better chance of actually achieving it. The important thing is to keep progressing in the right direction, not the speed at which you go at! I wish you all the best if you are aiming to make some big changes in 2019, and don’t hesitate to drop me a line to let me know how you’re getting on with reducing your “wasteline”.